Even though the cooler weather has officially arrived here, we are still enjoying cooking out and grilling. We have an amazing Kansas City meat rub that we use on ribs and my hubby is so good at cooking them on the grill! The only thing that makes me super nervous is making sure that the meat we grill is cooked properly and for the correct time. When I was younger, I was camping with my family and we all came down with horrible food poisoning from chicken. Having been through the awful experience of food poisoning, I know first hand how bad it can be to eat under cooked meat. So now that I have my own family, I am always very careful about how I cook meats. We know that maintaining a healthy, happy lifestyle is a constant challenge. At EatSmart we want to give customers the tools and confidence to meet the challenge head on. Founded in 2005, EatSmart Products is a leading designer and manufacturer of high quality, user friendly digital scales into the US market. The EatSmart product line currently includes some of the most accurate and reliable bathroom, kitchen and luggage scales available on the market today. Every EatSmart Scale is engineered to the highest precision standards, easy to use and uniquely designed to provide customers with consistently reliable products. When offered the opportunity to review an EatSmart Precision Pro Food Thermometer, I was very excited and happily agreed. So, for this review I was sent an EatSmart Precision Pro Food Thermometer and being that we are always cooking meat, it came in handy pretty quickly after receiving it. The first thing that caught my eye about this thermometer was the temperature guide on the probe cover. I love how it gives you the proper cooked temperature for different types of meats. I have NO clue about this so it is nice to have this information in a handy location. This thermometer is easy to use and easy to read! Simply insert the probe into the thickest part of the meat you are cooking and your temperature reading is ready in just 5 seconds. This means that any type of meat that you cook will be cooked perfectly! My biggest problem when cooking meat is over cooking it and now that I have this thermometer, I am able to cook our meats to perfection...no more leathery meat here! The probe is also smaller than most so that meat juices don't escape as easily, which is a nice feature. I have been enjoying using this food thermometer and finally I feel like I am being as careful as possible when it comes to cooking our food properly and thoroughly. 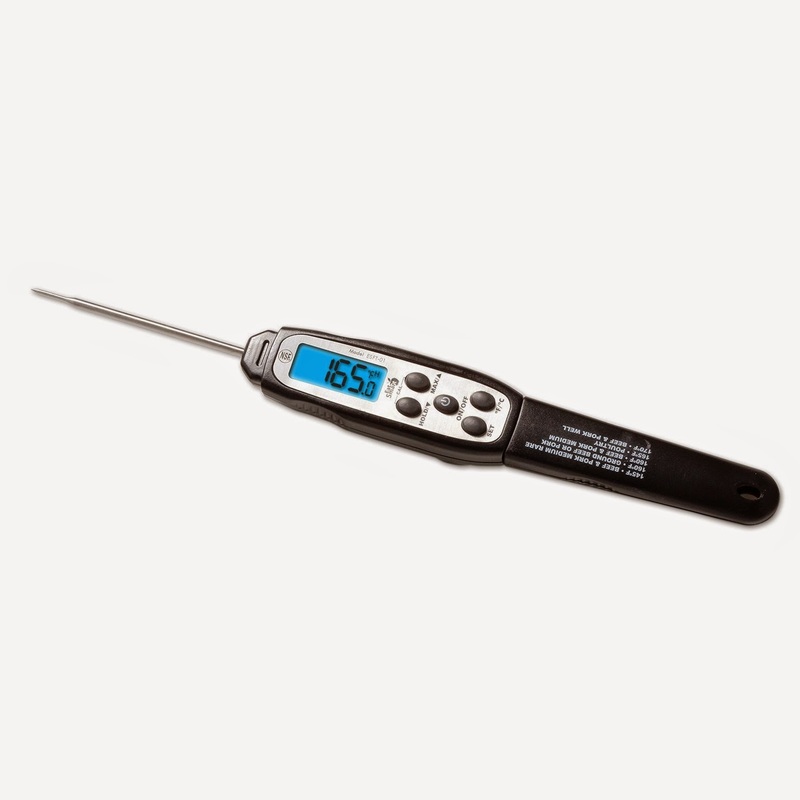 You can purchase this EatSmart Precision Pro Food Thermometer from Amazon and it retails for $19.95 (also eligible for free shipping!). Check it out today and also be sure you check out EatSmart's other innovative and helpful products. Disclaimer: I received no monetary compensation for this post. I did receive a free EatSmart product for review purposes. All quotes and stock photos are from the EatSmart website and email. All thoughts and opinions are 100% mine.